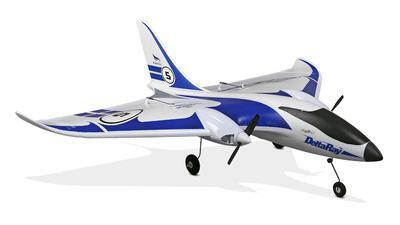 Was the E-Flight Delta Ray your first RC airplane? If so, how long did it take you to learn to fly it? Did you have help from an experienced pilot? Will the plane fly inverted? How fast will it go? What type of aerobatics is it capable of? If you have any video to share that would be great! I am really thinking of getting one for my nephew for his birthday. The delta ray is not my first plane but is the first one I've been able to fly as often as I like without crashes or other discouraging incidents. They come with 3 flight modes, beginner, intermediate and advanced. In the beginner mode plane takes off and lands by just adjusting throttle and pointing it in the right direction. If u over control or correct it will ignore the input and maintain safe flight attitude. Will fly very slow or at a pretty exciting pace. Intermediate mode allows more aggressive flight but still self levels if not given input. And in advanced mode it will fly inverted easily and has no problem with other stunts. This thing has been beyond fun. U won't be disappointed. Landing gear works well on hard surfaces or hand launches and grass landings are super smooth for park flight. When I first flew this plane in SAFE mode its stability amazed me, so much so that I find it hard to progress into the more advanced modes.. It's now been 6 months now and I am still in beginner mode. Many times I have switched into the intermediate and even advance mode when the plane is high up but I completely lose my nerve once the SAFE self leveling disappears. I have smashed up 2 Delta Ray's and now I'm on my 3rd ..lol .. ON both occasion I have burnt out the ESC and in the UK they are about £75 however, you can pick a Delta Ray (BNF) for £120 so I buy another plane instead and keep the other plane as spares. The Delta Ray ESC or motherboard as I prefer to call it are not always reliable and many times I have had to re-bind the ESC to get the SAFE working correctly. .. Lately I have been flying the Apprentice 15e on my Phoenix sim and I feel this plane would suite me better and help me advance to another level so I am going buy it. Yes a good plane for beginners to throw up and fly straight away. A great plane for experts performing stunts in advance mode but I feel it's been an expensive way to learn to fly a RC plane, well it has been for me anyway!